In his interview with CNN's Soledad O'Brien on Wednesday, Imam Feisal Abdul Rauf defended his plans to build a mosque and Islamic center near Ground Zero, saying "You cannot heal a trauma by walking away from it. We have to sit down. We have to talk about it. We have to dialogue about it and find a way to move through it and beyond it." But a trove of videos and writings available on the Internet shows that a longtime partner of Rauf believes the 9/11 terror attacks were "an inside job" by U.S. government and corporate interests, the Investigative Project on Terrorism found. Faiz Khan, a physician who claims to have been a first responder after the September 11 attacks, is a founding member of the Muslim-Jewish-Christian Alliance for 9/11 Truth and is on the advisory board of the Muslims for 9/11 Truth. In an essay on the Alliance's website, he argued that "the prime factor for the success of the criminal mission known as 9/11 did not come from the quarter known as 'militant Islam' although the phenomenon known as 'militant Islamic networks' may have played a partial role, or even a less than partial role - perhaps the role of patsy and scapegoat." In speeches, Khan says people in the Third World, where the "sleaze of governance" is more of a given, few people question whether 9/11 was an inside job. Khan also helped form the American Sufi Muslim Association in 1997 with Rauf, a group now known as the American Society for Muslim Advancement (ASMA). ASMA and Rauf's Cordoba Initiative are leading the mosque effort in lower Manhattan. Khan has led Friday prayers at the Al Farah Mosque, where Rauf is the imam, for years. That practice continued at least through December – after the mosque proposal was unveiled -- when Khan was cited and photographed in an article in the German magazine Der Spiegel on the project. Khan and Rauf also are members of the Sufi Circle, created in 2004 to promote "a Divine Love, unity and tolerance for a happy and meaningful life." In an announcement for a pending appearance, Khan's photograph on the Sufi site comes from this 2005 speech he gave explaining his beliefs about the 9/11 attacks. Cropped out is a sign behind Khan that reads "Expose the 9/11 Cover-Up." "There's no such thing as a Saudi nation, there is a royal sleazy family there. And there is no such thing as the American nation when it comes to 9/11 because there's a sleazy mob, if you will, in the White House that co-opts Washington, D.C. and actualizes the agendas of Wall Street. That is the way things have worked all throughout history." "I am not sure what happened on 911, and as I have stated in articles, and other sources you may have come across - the 'official explanation' is demonstrably false...since multiple facets of it have been shown to be thus by independent investigators." Rauf and Daisy Khan never discussed 9/11 theories with him, Faiz Khan wrote. Despite being cited in the December 2009 Der Spiegel article about the mosque project, Khan said he hasn't spoken with Rauf or Daisy Khan "for several years now." On June 3, 2006, Khan spoke at a 9/11 truth summit called "Revealing the Truth/Reclaiming our Future" in Chicago. In his remarks, he acknowledged that there is a militant Islamist movement, but "the most logical explanation" for 9/11 is that the hijackers were "working for us" in furtherance of a corporate-controlled schemes involving gigantic stock trades, billions of dollars in heroin sales and interest in Caspian Sea resources. The speech was videotaped and remains available on the Internet. In it, he traced his doubts about the attack to the days and weeks immediately afterward, explaining how he stopped serving as a clergyman at memorial services for 9/11 victims because "I would ruffle a lot of feathers at a memorial service if he got up there and said it wasn't just angry Muslims gone bad. There's a lot more to this." He provided a similar account at another meeting captured on video. A month later, he moderated a panel at a joint ASMA/Cordoba Initiative conference in Copenhagen. The conference was part of ASMA's Muslim Leaders of Tomorrow program. His biography identified Khan as a member of ASMA's board of directors and "Assistant Imam at the Al-Farah Mosque in Manhattan and the Islamic Center of Long Island. Since 9/11 where he treated victims of the tragedy he has embarked to dispel misunderstandings about Islam." It's a mistake to blame the attack on "angry Muslims gone bad." There is a strain of militant Islam. But "are these the guys the one who brought down the WTC or are they the patsy?" The most logical explanation for 9/11, he said in Chicago, is "that they are still working for us. And this goes into, well, who's us and who's them? Right? How do you define America, how do you define nation-state anymore? Has this become a kind of trans-national phenomena at this point? So they're still working for 'us,' but we're not 'us.' But who is us? Corporate interests is us. Special interests is us. But that's not us, the American people. So that is the most logical explanation – that these people are still working for working for us." Intelligence failures were the result of benign neglect or worse fueled by Wall Street, corporate America and the banking industry. "The fact that all the directors and all the highest ranking officials of the national security apparatus are from that sector. This CIA, the NSA, is a creature of corporate America. It is not a creature of the American interest." The heroin trade creates billions of dollars which are laundered by Citicorp and Procter and Gamble. "They all launder." "The state of Israel, its criminal establishment, its secret service and its use and marriage with false flag operations." 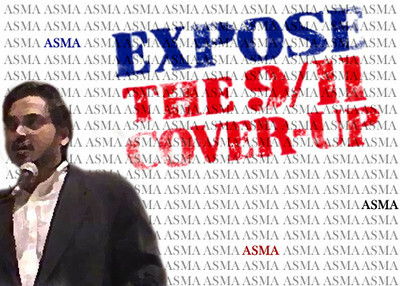 The latest posting on the website for Muslims for 9/11 Truth is by a Dr. Syed Zaidi who proposed that after a "neutral" United Nations investigation of the 9/11 attacks, if it is determined the U.S. government was complicit in the attacks, a huge mosque should be built at the very Ground Zero site itself as a measure of atonement to the world's Muslims. RAUF: Well, I mean, Osama bin Laden was something, you know, we had worked with before and we seen what bin Laden did. And the sentiment certainly was bin Laden has shifted and we see what has happened and we have to understand what has happened in order to solve it. But we -- we -- the work that we have to do now is not about pointing fingers. O'BRIEN: People always say that to me, I don't want to point fingers, when they don't want to necessarily answer the question, which is do you think the U.S. was responsible for those attacks on its own soil by terrorists? RAUF: I was also trying to say -- to share part of my role in bridge building, Soledad, is like what I do when marital couple comes to me, you know, when they've had some discord, for counseling. And part of what I have to do is to speak the truth to each side, or to tell them, when you say this, your husband hears that. When you, sir, when you say this, your wife hears that. It is part of my responsibility as a bridge builder to speak the truth about what's great about America, what we've done right, and what our less glorious moments. And many people feel that the Iraq adventure, for example, has been one of our less glorious moments. But unless we're able to look and speak truthfully and understand the issues, then the conversation is going to devolve into a situation where we're not going to be able to work and build bridges towards peace. Faiz Khan has maintained a low profile as the mosque debate intensified but his writings and speeches remain available and overlap with his work with ASMA and his preaching in Rauf's mosque. The Der Spiegel article quotes him marveling about the "wonderful potential" of the mosque site and his belief that "New York can be a place of healing." What Khan thinks caused the wound is not in sync with most New Yorkers. But to Khan, there is nothing to debate. "I don't speak in conspiracy theory," he said at the Chicago truth event. "I speak in terms of conspiracy fact." By delving into it, he told an audience, they are conducting "the most exalted jihad." I am happy to confess I don't know what happened on 9 11. The truth is no one knows. The official story is unscientific and improbably which leaves open what really happened. For example how did the hijackers get their weapons through the airport metal detectors? How did they get through the sealed cockpit doors before the pilots were able to press the hijack alarm. How did building 7 fall in the way that it did? How did the hijackers navigate the planes to the WTC buildings (you can't navigate commercial passenger planes to specific buildings)? Why was the american air defence system unable to srcamble fighter jets for well over an hour? (every time in the past it has taken a maximum of 7 minutes to scramble a plane to inspect) How did Hani Hanjour pull off an impossible turn? Why would he even attempt an impossible turn? The list of questions just go on and on. Until these are answered the official version will never be universally accepted. As time goes by I think it will be shown to be false. Should we consider all truthers terrorists? I know few we might be able to round up and put in their supposed non existent FEMA camps. Really? Do you beleive your own BS? I don't! How can you get up there and speak of this with a straight face? Go, Go back to your third world upbringing. People like you don't deserve to live here. If you want to be an American then you must support America! We all have the right to speak our mind in this country, no matter how insane it is! But to publish this nonsense and give lectures on it is the equivalent (to me) of trying to get us to drink your special Kool-aid! Bin Laden admitted responsibility for 911. The video is on the internet. What additional evidence is needed? There is plenty of proof. Just like Pearl Harbor, 9/11 attack was successful because of the incompetence of the US Govt. Study any of the old mythologies(Greek/ Hindu/ Norse) to understand the concept of hubris.